First impressions mean everything and when a cute puppy greets me as soon as I get off an elevator then you already won me over. Upon walking out of the elevator onto the bright sunlit Joy Cioci's showroom I was not only greeted by warm smiles but also the sweetest dog ever, Ace. The warmth of the sun and the clean sleek showroom was the perfect backdrop to her racks of clothing that held her Fall 2012 collection. Lined up against the window the collection was neatly placed into rows and sections that was thoughtfully color coded and selected-- darks and grays on one rack, oranges and reds on the other, so on and on. Cioci's Fall 2012 collection was all about "seductive survival" which was easily seen in her prints, fabric choices, and cuts. Each of her fabrics reflected each other-- the bright orange leopard print was reflected in multiple pieces along with her snake skin prints, even the use of lace and cable knits were paired with each other. Her use of light flowing fabrics and sheers mixed with interesting pattern played the important role in the seductiveness of her clothing. This line is all about femininity, youth, and feeling empowered by your body. I haven't been in love with the whole peplum trend but I'm in love with Joy Cioci's leopard print peplum top. This top is toned down in the sense of the peplum-- color and print not so much which probably helps me love it even more. Some of the peplums that I have seen in-stores and on bloggers are to exaggerated to me this top to me is more dainty and actually wearable for most average woman. The weight and the way it falls seems less scary and makes me want to try it on. For girls with hips and curves can see my slight fear of the peplum...we don't want to make ourselves seem wider then we already are. But the way this falls just seems that it wouldn't extend out but fall perfectly extenuating the hips. I've always have had a love/hate relationship with fur. The environmentalist/animal lover in me hates the idea of killing animals for it's fur but the fashionista in me can't help but find it deeply beautiful (when done correctly). As soon as I saw the white jacket with the fur vest I couldn't help but fall in love with it. It was crisp, feminine, and not over done or worked. Cioci has a knack for keeping pieces simple even when they are grand. This piece stands out on a level all on its own with the tiered fur. I'm head over heels in love with Joy Cioci and her Fall 2012 collection. I'm deeply impressed by this whole collection-- her use of colors and prints are impeccable. I'm a fan of designers that are unique; who have their own ideas, designs, prints, and techniques. I also love designers that are genuine in their personality and their work. There is nothing but genuinity in Cioci's Fall 2012 collection. So this weather is throwing me for a loop-- last week it was so warm and beautiful and well this week we are back to the 50s. I wasn't expecting it to pretty cold...so the smartest idea wasn't to wear my light weight trench and a skirt with no tights. Whatever I braved it bare legged with my mix prints. I just want to say that these Jeffrey Campbell shoes were a TOTAL steal. They were 60% off from the LF Only Sale of the Season. I had been looking for a comfortable bootie that had a little bit of a cowboy feel. Once I saw them I hoped and prayed they were my size...BEHOLD they were! HAPPY DAYS!!! So here is the nerd in me...I'm a total Hunger Games freak. I have been wanting to read this book and when I finally got around to it I read it in less then a week. I haven't been so captured by book in a long time...the last one I can even think of is Water For Elephants (which that to was turned into a movie). I love the way Suzanne Collins writes in the tone of Katniss and her attention to details. Even though through the first book and now the second one I have to often remind myself this is a teen novel. The love story that is intertwined in the book plays an important role but sometimes is over powered and sometimes I wished she focused on the darkness of the Capitol...With saying that these books are dark and I was actually quite surprise how bloody it is (yes I knew what the book was about but honestly you feel the power of the Hunger Games through her writing). Anyway...I love Peeta and I think Josh Hutcherson did a great job portraying this love stricken, charismatic guy. I even must say Hutcherson is so awkwardly cute. Sorry Gale but I have a super soft spot for Peeta. There were times during the book where I had to hold back my tears since I was on the train and let me tell you I definitely cried during the movie. 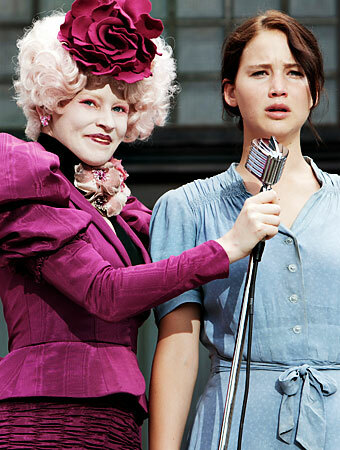 I was really impressed by the costume for Effie and Elizabeth Banks portrayal of her. Before the movie I wasn't sure how that was going to work out. But to my surprise Banks was spot on with her character. I even loved the costume design for Effie...it really helped that Collins gave such detail explanation on her characters look. I was a bit disappointed in the chariot scene since in the book it's SOOOOO grand but to me in the movie it fell so flat. Instyle.com has up a gallery of designer sketches of Katniss Firedress...they should have went with one of them....Just saying. Overall the movie was good, not as great as the book. If they put all the details from the book into the movie it would have to have been more the 2 hours and 22 minutes for sure. PS The nerd in me really wants a replica Hunger Games Training shirt! SO BADASS! Also loving the China Glazer Hunger Games nail polish. Are you into the whole Hunger Game fandemonium? This is what I wore on the perfect spring day on Thursday. It was one of those days where I just wish I could sit outside all day instead of sitting in a cube. My co-workers and I for lunch had decided to go out for lunch which meant dragging our feet back to the office. But at least my feet looked great in my Chinese Laundry Milk Shake Tribal and for the walk we had they didn't even hurt. Between my new pair of H&M jeans and these shoes-- they are my two favorite and key pieces in my spring wardrobe. This past weekend the boyfriend and I went up to Hartford, CT to visit our friend who lives up there and to do a pubcrawl for St. Patrick's Day. Since I had planned to probably be tired, hungover, and for a two hour car ride I packed my comfortablest pieces I had. I'm not much of a sweatpants type of girl and the only other sweatpants that I own I only wear to the gym...so these are my exception. I had picked them up at A Wang sample sale a year or so ago-- once I saw the leather details on the pocket I knew they had to be mine. I love dressing down sometimes. I just love being comfortable....and if I could all my key pieces would be from Alexander Wang. What is the comfortest thing you own? I believe that every woman needs a staple dress in her closet. One that can be taken to and from different places and occasions. It's so important to have a dress that an be dressed up for the everyday things like work...cocktails...etc...and then for the more momentous occasions like an interview...meeting the parents....weddings...etc. The fun part about these dresses are playing with accessories. Dressing up is all about having fun-- even dressing up for work should be fun. Just because you need to be more business or business casual it doesn't mean you can't break out your favorite pair of leopard print pumps. Accessories really make the outfit, you can dress up a simple casual dress by pairing it up with a blazer and heels. Weddings or dinners all you need is a statement jewelry piece and a pair up pumps. Last week I decided to break out my more dressy dress what I like to call my "Every Occasion Dress" because it finally was the first time I would be able to wear it without tights and we had a goodbye cocktail party after work that I felt it would be appropriate to wear to. This dress is a lot more dressier then I usually get dressed for work so to play it down I decided to wear it with by red booties and black lace blazer. I had bought this dress from Aritzia back in October for my boyfriend's sisters wedding rehearsal dinner where I wore the same necklace as above but instead of red booties I paired it up with black pumps and grey tights to keep it looking casual enough for dinner but still appropriate for the Church. I love that this dress if needed can also take me to an interview if paired up with a simple blazer and keep it me by wearing fun shoes. Do you own an every occasion dress? (coat: elie tahari, jeans: forever21, shoes: aldo)---don't ask what I was doing in that picture I'm a huge goofball. The boyfriend and I celebrated our 4 year anniversary together this past weekend. We had bought a Livingsocial deal at the Glen Cove Mansion in Long Island. It was a nice little getaway for the two of us. It was specially nice to spend some alone time together with no computers and really just hanging out and reconnecting. With the package we got a free bottle of champagne, chocolate covered strawberries, free wine and cheese hour and two free drinks at the Pub at the hotel. 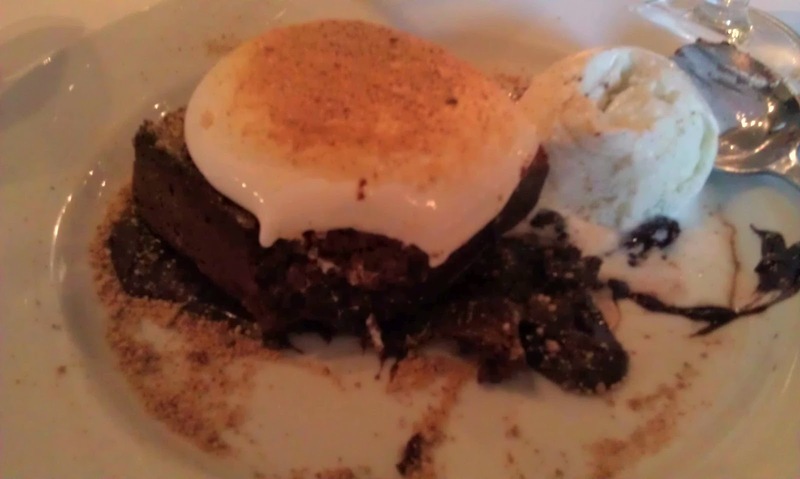 Saturday night we stuffed our face at a local grill that had smore brownie desert then played pool and darts at the Pub. This weekend really makes me look forward to our Punta Cana trip even more. I'm so lucky to have a loving and adventurous bf who can put up with my photo taken self.